Yep, and actually... its working now. I'm accessing it externally, after clearing the self-signed warning, I'm able to access. The only change was enabling that "Report HTTPS as external address". Seems I had to give it time to update the Emby connect? Not sure. First test after enabling "report https as external address" failed with the log I submitted above. No, here is the problem. The browser is rejecting the self-signed cert. You are able to override this in the browser by using the address manually, but unfortunately our code cannot (for security reasons obviously). - your own domain with a trusted ssl cert that the browser won't reject by default. It's possible that after overriding manually, the browser is applying this override to our programattic http requests, which is why it's working now. But I don't think this will be permanent and it will also have to be done on other devices. Both 8920 and 8096 ports are NAT'd out on my pfsense router. HTTPS://app.emby.media does not. Inside and Outside of my local network. We're unable to connect to the selected server right now. Please ensure it is running and try again." http://portchecker.co/check shows HTTPS port 8920 is open and listening. "Report https as external address" is not checked. This is running on my FreeNAS box in a FreeBSD jail. I've seen other users having issues with this since 2015. Edited by pheed, 15 August 2016 - 08:21 AM. Hi, in chrome can you try this again, only this time, before you login, right click anywhere -> inspect. then try to login. then check the console for any errors as well as check the network tab to analyze the requests that were sent out. then capture that info and provide it here. thanks. Mixed Content: The page at 'https://app.emby.media/selectserver.html'was loaded over HTTPS, but requested an insecure resource 'http://192.168.1.23:8096/emby/system/info/public'. This request has been blocked; the content must be served over HTTPS. Fetch API cannot load http://192.168.1.23:8096/emby/system/info/public. Failed to start loading. Mixed Content: The page at 'https://app.emby.media/selectserver.html'was loaded over HTTPS, but requested an insecure resource 'http://<EXT.IP.REMOVED>:8096/emby/system/info/public'. This request has been blocked; the content must be served over HTTPS. Fetch API cannot load http://<EXT.IP.REMOVED>:8096/emby/system/info/public. Failed to start loading. Tested all connection modes. Failing server connection. Edited by pheed, 15 August 2016 - 01:55 PM. Mixed Content: The page at 'https://app.emby.med...ectserver.html'was loaded over HTTPS, but requested an insecure resource 'http://192.168.1.23:8096/emby/system/info/public'. This request has been blocked; the content must be served over HTTPS. Fetch API cannot load http://192.168.1.23:...tem/info/public. Failed to start loading. Mixed Content: The page at 'https://app.emby.med...ectserver.html'was loaded over HTTPS, but requested an insecure resource 'http://<EXT.IP.REMOVED>:8096/emby/system/info/public'. This request has been blocked; the content must be served over HTTPS. Hi, what did you try here? did you click on your server and connect, or did you manually enter the address? The above log came from clicking on my server. Ok, two things. If you click on your server it will use the server reported addresses, which right now is http since you have not enabled "report https address". So in your case, you will want to just connect manually via address. However, this looks appears to be purely an issue of connectivity. Are you able to take this address and put it into a browser and connect? connectionmanager.js?v=3.1.6070.42676:1036 Tested all connection modes. Failing server connection. Why is it attempting to connect to my LAN address from external access? 2. Yes I can take that address and connect. It's just standard protocol because users use the same connection flow no matter how they're connecting. In most cases, connecting to the LAN address is more desirable when possible, so that's why we always try that first, then fallback to the remote address if it doesn't connect. Ok, since you can put that url into the address bar, then I'll look into why the same http request is failing programatically. Thanks. Are you using the default self-signed cert that is installed by the server or did you customize with your own? Edited by pheed, 15 August 2016 - 02:40 PM. When you put that https url in the browser, do you get an SSL warning? Edited by pheed, 15 August 2016 - 02:49 PM. Gotcha, time to setup LetsEncrypt SSL with DDNS I just attempted to access https://app.emby.media from my laptop, and it wouldn’t connect. Confirming what you said. Thanks for the help Luke. Edited by pheed, 15 August 2016 - 03:12 PM. Just an update after spending hours getting Emby+LetsEncrypt on FreeBSD running. https://app.emby.media is connecting properly as long as I'm in Chrome. Firefox still gives the error, but seems LetsEncrypt root won't be trusted by Mozilla until Firefox 50. So no worries there. So I added DEFAULT_VERSIONS+=ssl=libressl to /usr/ports/security/py-certbot/Makefile. Then reran make install clean. If it reports its already installed run make deinstall then make install clean again. Opened port 80 and 443 to NAT to the FreeNAS jail LAN IP. Entered email address and accepted ToS. Then moved the resulting .pfx file to emby's install directory. 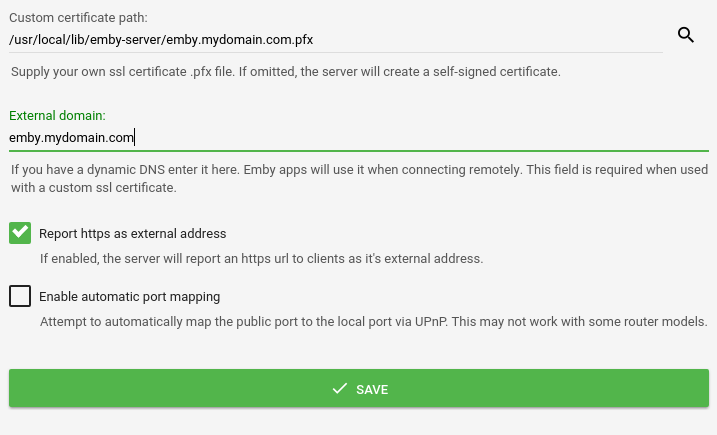 Finally, back in emby's "Manage Server" Web UI -> Expert -> Advanced added /usr/local/lib/emby-server/emby.mydomain.com.pfx to the "Custom certificate path" and added emby.mydomain.com to "External domain". Restart emby-server and remove the port 80/443 NAT holes I created in the firewall. Leaving only port 8920 open for emby's default SSL port. Edited by pheed, 16 August 2016 - 11:21 AM.